This week, I’ll be touching a little more on social media and the effects it can have. Last week, I took Thursday and Friday off for a four-day vacation. My first month as manager was quite a barrel run. Between finding a dead man in our parking lot and everything else in between, I’ve needed a breather. Just about anyone who knows me can tell you that I don’t like live music. As much as I love live events like musicals and plays, I usually bow out of live music events. Why? Noise: I’ve progressed beyond super loud concerts that make your ears ring for a day. People: By this, I mean the kind of people who go to concerts. On a scale of “hipster/YOLO kids” to “22 and doing cocaine in the bathroom”, I’m a “have a single drink because I have work in the morning” type. You’d be surprised how few of those types you’ll find! I’m talking about Irish step dancing. I saw both Riverdance and Lord of the Dance when I was younger, and I’ve loved Irish dancing since the first moment I saw it. The dancers, the music, everything about it struck my Irish core. In case the pale skin, freckles and red hair didn’t give it away, I’m Irish. If you have no idea what I’m talking about, here’s an idea of the look and sound. So about a year ago, I realized I haven’t seen Irish dancing in forever. Much to my dismay, there were no shows available. At the time, everyone was touring internationally and I wasn’t about to skip over to Germany for a weekend. “Meh, I’ll sign up for their email list anyway.” Fast forward six months later to the email announcing The Riverdance 20th Anniversary Tour – the first USA tour they’ve had in four years. It was a two-hour drive to the Lutcher Theater in Orange, TX where Riverdance was showing, but totally worth it. Look, I know you’re really excited now that you’ve watched that video, but keep calm and stay with me. Like any theater, there’s a “No filming/photography during the show” policy, so I snapped a quick pre-show pic before the show started and posted it to my Twitter and Instagram with some hashtags. Sorry, I sometimes forget I write for more than just millennials. Hashtags are a great way to help the world find your stuff. In this case, hashtags like #Riverdance, #Irish and #dance would be appropriate. Yes, hashtags may seem like it’s for kids who wish they were a Kardashian, but I’ve come to realize A) it’s a great way to get your things noticed by people who share your interests and B) it really depends on what you’re tagging and the context. #Batman, #Superman, or #comics might be a post that interests you, or maybe you’re the #GirlsNightOut, #DuckFace, or #OMG typ. Maybe you’re even the trendsetter who #CompletelyMakesUpRandomTags for no reason. Whatever floats your boat, though I’m not really a duck face person. Hey, wait a minute. 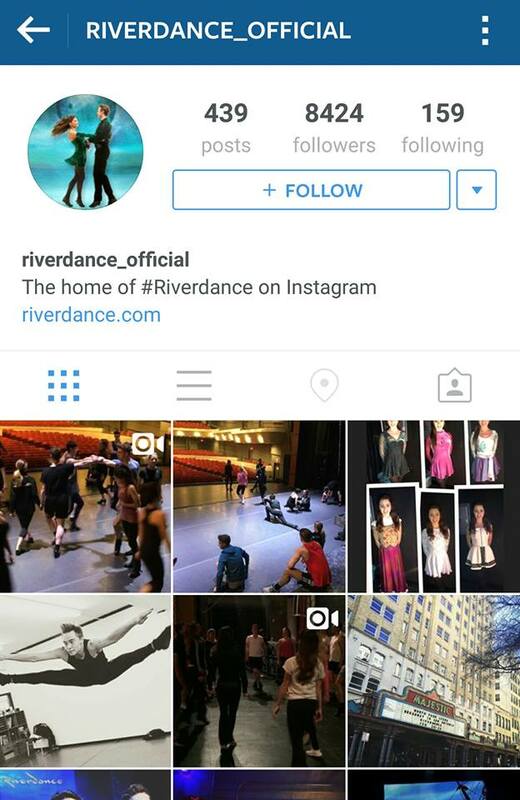 Does that last one say “riverdance_official”? 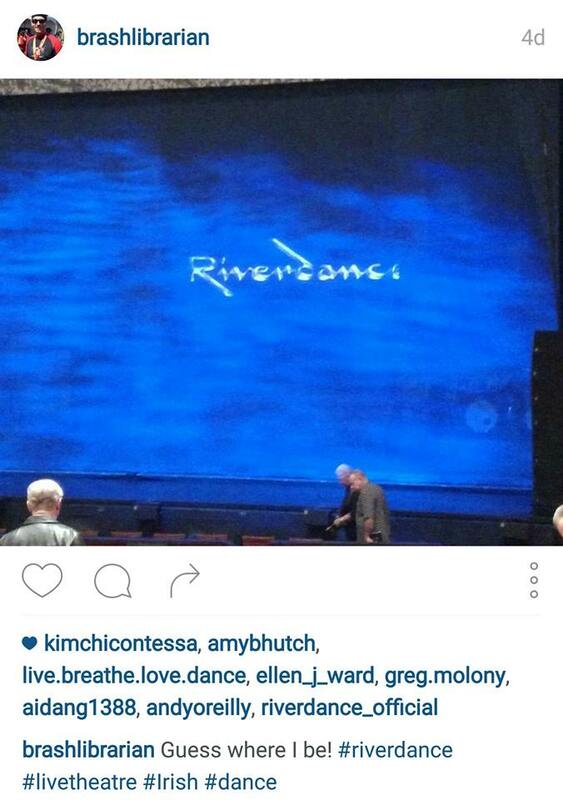 Yup, the actual Riverdance dance company appreciates my photo. Whaaaat! 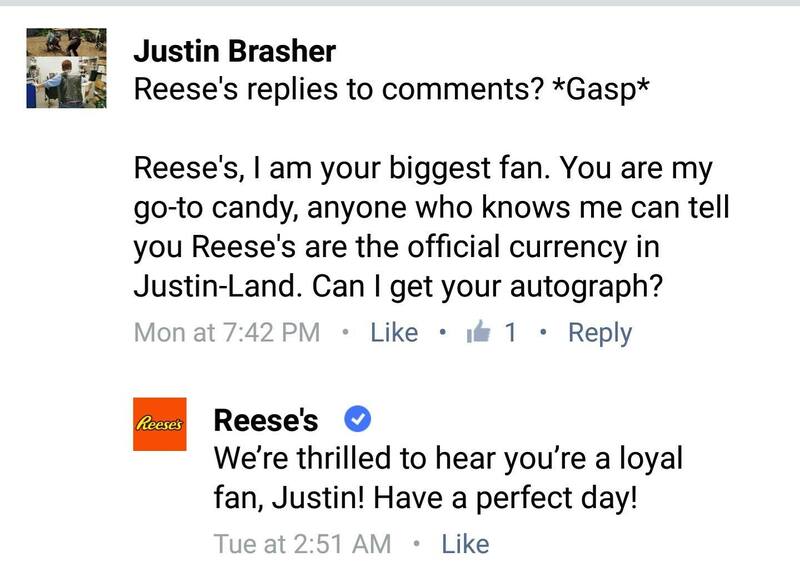 This is like the time I learned Reese’s Peanut Butter Cups has its own Facebook page. 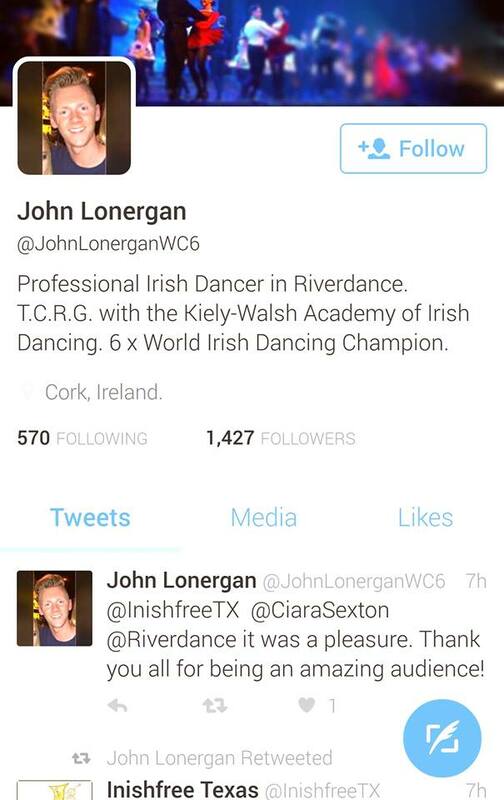 So, Riverdance knows who I am – pretty awesome, I can go to bed happy. I’ll just check one last thing on Twitter before I go to bed. Oh cool, some people liked my tweet. Who’s this John Lonergan guy? He kinda looks familiar, though I can’t think of where I would know him from. Eh, I’ll just click to his profile and see. …Oh. I could be wrong, but I’m pretty sure he looks familiar because I may have just watched him dance for 2 or 3 hours. Okay, hashtags are a passive way to identify information and make it easier to find, whereas @ symbols are used to directly send it to somebody. (Like you’re speaking @ them, how clever!). To me, this kind of interaction on social media is vital. People like being noticed and appreciated, especially by world-class organizations and performers; I think a large part of it is just knowing that there’s somebody on the other end and not just a robot. 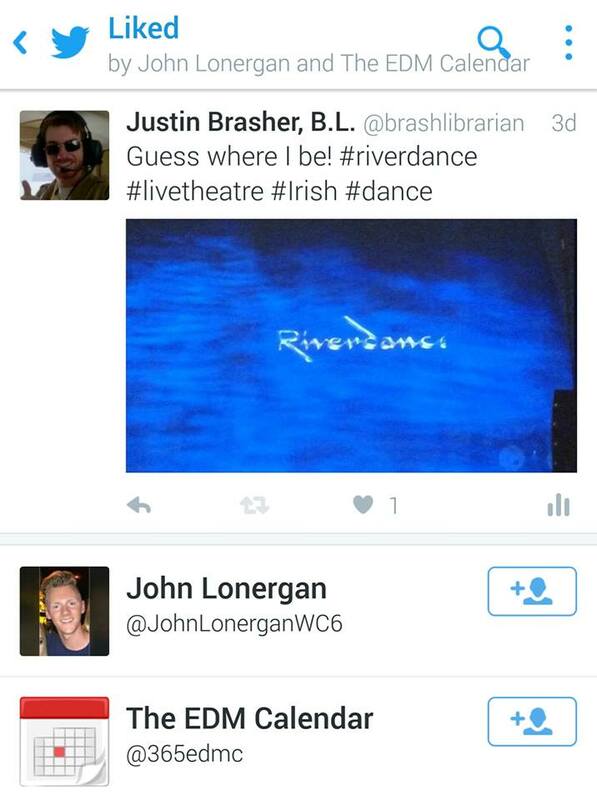 With that, I thank John and the whole Riverdance group for totally making my day. There’s a good chance they would have never seen this photo if I hadn’t thrown a few #’s in there. If you have a hobby, interest, or skill that you want to show the world, be sure to include your hashtags and you could be the next thing that goes viral. If nothing else, it helps you connect to people who share your passions. I remember when I used @’s and #’s while writing Part Two of my interview how-to series with Boise Public Library – that went viral for a day or two and garnered hundreds of likes, follows, reposts and the like. The internet is an amazing place, filled with world dancing champions and Reese’s. Next goal: eat a Reese’s and watch Riverdance at the same time? Nah, I’ll eat them before. That’s all for this week, everyone! If you’re ever posting anything library-related or just want to say hi, I’ll be right here @BrashLibrarian. Now go have a great Friday! This entry was posted in Brash Jobs, Uncategorized and tagged Brash, Brasher, dance, funny, instagram, Irish, librarian, library, library science, Lonergan, Lutcher, MLS, riverdance, social media, theater, twitter. Bookmark the permalink.